Cragar Unique Series 83 OEM Replacement Steel Wheel Size: 17" x 7"
The Cragar Unique Series 83 OEM Matte Black Steel Wheels are designed to be low cost, high quality wheels that are made in the USA to fit your front wheel drive (FWD) or all wheel drive (AWD) car, sport utility vehicle (SUV) or crossover utility vehicle (CUV). They are perfect for replacing damaged OEM steel wheels or protecting your aluminum wheels from the harsh driving conditions that winter weather brings. The matte black finish offers a durable factory appearing coating that looks great as-is, behind hub caps or as a base for paint. The Cragar Unique Series 83 OEM Wheels are available in 13", 14", 15", 16" and 17" sizes to fit most early and late model front wheel and all wheel drive cars, SUVs and CUVs. 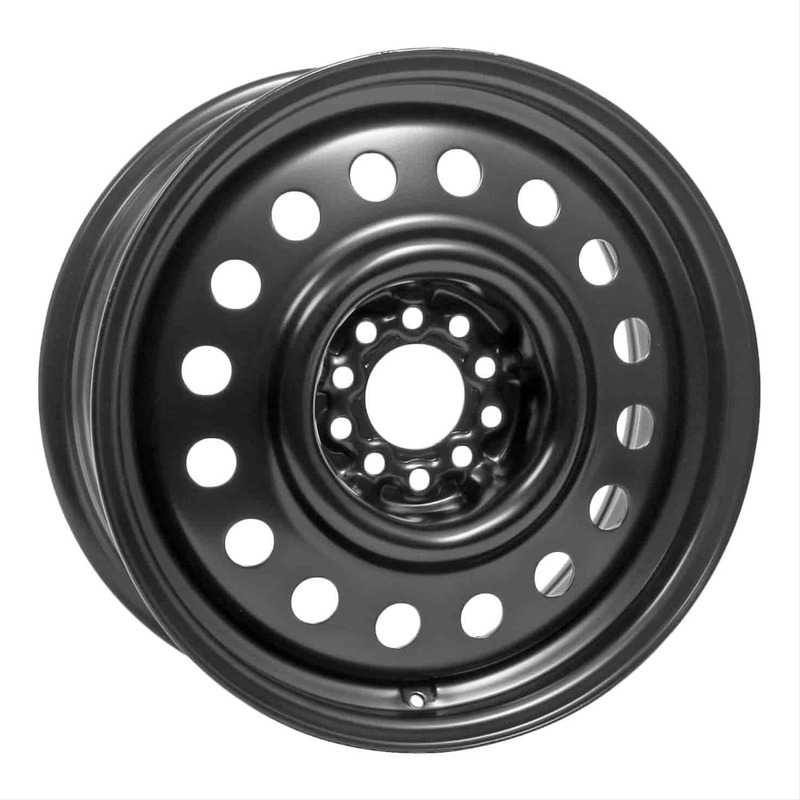 83-7714 - Cragar Unique Series 83 OEM Matte Black Steel Wheels is rated 5.0 out of 5 by 1. Rated 5 out of 5 by Professor Value from Right Size, Right Price. Service and communication were excellent and online ordering was easy. They helped me to make sure the rims would fit my vehicle and then free-shipped them fast. The quality is very good and the price is very reasonable. Yes, this wheel should fit your Toyota Camry. The bolt pattern is correct, but check the diameter for brake clearance. The RS has 19&quot; wheels originally and these are 17&quot; in diameter. Yes, this wheel will fit the Ford C-Max Energie. I need 6x7.25 bolt pattern wheels. Do you have any options? We do not have any wheels with that bolt pattern. What size do I need for a 2007 Ford F-150. I have 17 inch wheels? Neither the correct size or bolt pattern is available with this wheel. Will this fit 2017 Toyota iM? Yes, this is the correct size and bolt pattern for your vehicle. Will this rim fit my 2007 Chevy Trailblazer SS awd? Going to use them with snow tires. No, the SS trim had 20&quot; factory wheels. No, for a 17&quot; wheel you would want Cragar 83-7717 .